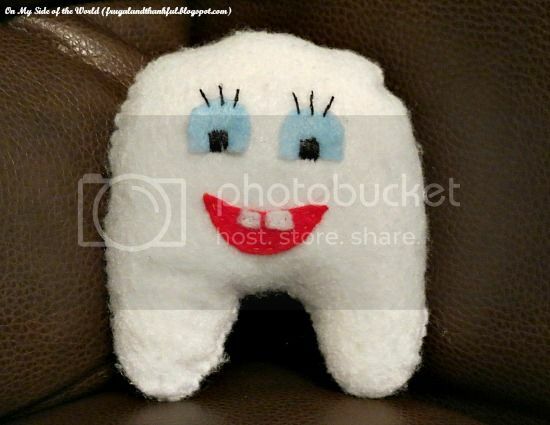 Frugal and Thankful: An "emergency" tooth fairy pillow. An "emergency" tooth fairy pillow. Our oldest is 7.5 years old. He's fun, witty and so handsome. He's also very impatient. And one thing that was making him grow especially restless was something that is common to most of his classmates - and that is losing his first tooth! I swear, he's literally the last kid in his class! The pillow is great and has such a cute face. Brilliant idea. I didn't lose my first tooth until the summer before second grade. Losing your first tooth is a big status symbol at that age, so I know how your son felt. Congratulations to him on losing his first tooth. And congratulations to you for getting the cute pillow done. What a happy pillow!! As much as I sew I too seem to get behind more often than not too.